"This is a delicious and irresistible recipe that everyone loves. It pairs creamy potatoes, crunchy onions, smooth gravy, and yummy sausages!!" Wonderful meal that always is made in my house during Octoberfest season. I use turkey, beef or chicken sausage & it always turns out supurb! 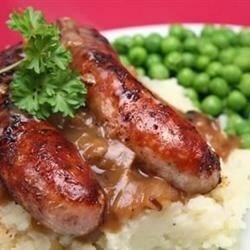 I had never had bangers and mash before but always wanted to try it so I made this recipe. I really enjoyed it. Loved it. I will make again and again.